You can listen to a podcast review of this movie below, or subscribe to Bina007 Movie Reviews in iTunes. Wow. Just wow! 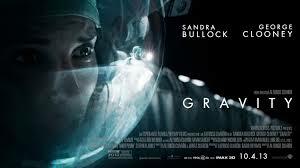 GRAVITY is visual story-telling at its finest - a movie full of stunning setpieces and breathtaking space-scapes. The technical mastery involved in creating an immersive experience of zero gravity is clear, but it's never allowed to trump the pure emotion at the movie's heart. Sandra Bullock plays Ryan Stone, a scientist brought on her rookie space mission, helmed by veteran astronaut Mike Kowalski (George Clooney). We get about ten minutes of funny banter between the two and their third crewmate (played rather improbably by Ronnie from Eastenders!) before a missile strike at a Russian satellite sets off a chain reaction of debris that knocks spaceships and stations out of the sky. The movie then turns into a race against the odds thriller, as our heroine tries to get back to her ship, and then to a functioning space station with an escape pod, and somehow land on earth. However, in contrast to CAPTAIN PHILLIPS, who tension never let up, GRAVITY is punctuated with moments of quiet, pained reflection and deeply felt emotion for which Sandra Bullock will presumably be nominated for an Oscar, going up against Cate Blanchett for BLUE JASMINE. What I love about Alfonso and Jonas Cuaron's screenplay is that it has the balls to be pure - not to sidetracked or to feel obliged with any audience pandering nonsense. This is the story of a middle-aged woman, who has been beaten up by life, relying on herself to get home. In its own quiet way, for a Hollywood film in which women are typically adjuncts of men, or falling apart in a flappy romantic way, this is rather subversive, and certainly some of the costume design hints at the strength of the Ripley. How right they were to cast Sandra Bullock - an actress who simply drips integrity and authenticity and just makes you will her to succeed. But really, the big story of this movie is the astounding technical achievement - led by Alfonso Cuaron and his Director of Photography Emmanuel Lubezki (TREE OF LIFE). I saw this film on the massive Odeon Leicester Square screen in 3D and that was immersive, but I can't wait to see it again in IMAX. This surely has to be one of the most beautifully produced space movies of all time, and rather than wait for DVD or TV, you really must try to catch it on the biggest screen you can find. GRAVITY has a running time of 90 minutes and is rated PG-13 in the USA. The movie played Venice, Telluride, Toronto and London 2013. It opens this weekend in Australia, Germany, Hong Kong, Hungary, Italy, the Netherlands, New Zealand, Macedonia, Russia, Canada, Estonia, India, Spain and the USA. It opens on October 10th in Argentina, Brazil, Israel, Peru, Singapore and Mexico. It opens on October 18th in Iceland; on October 25th in France, Chile, Portugal, Norway, Sweden and Turkey; on November 7th in Denmark, Finland, Greece and the UK; and on December 13th in Japan. That's funny because he was in the Hollywood Reporter saying it was the most authentic depiction of zero gravity and space travel on film. Which I admit is not the same as saying it's perfect - but he seemed really pleased with it.